RBTH presents a selection of views from leading Russian media on international events, featuring reaction to new Greek Prime Minister Alexis Tsipras’ pro-Russia stance on the sanctions issue, as well as reports on Ukraine’s attempt to reduce its dependence on Russian gas and the details behind the closure of McDonald’s branches in Russia in 2014. Greece could become an outpost of resistance in the EU against the sanctions imposed on Russia, writes the centrist newspaper Nezavisimaya Gazeta. 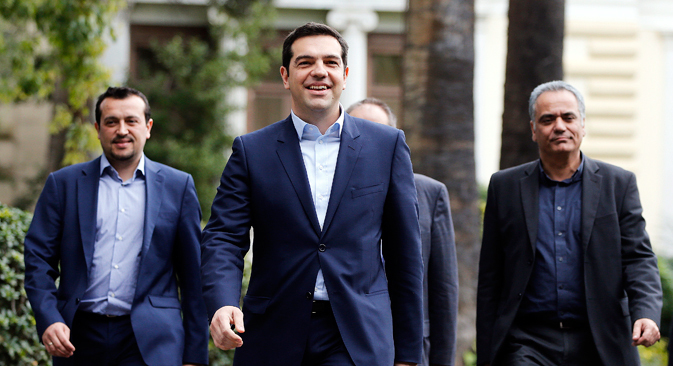 While observers were speculating over just how powerful Alexis Tsipras’ anti-austerity policy against Angela Merkel will be, the new Greek prime minister unexpectedly dealt his first blow on a completely different topic: the sanctions against Russia. In an unprecedented move, Tsipras, who leads the Coalition of the Radical Left (SYRIZA), publicly rebuffed a statement published on behalf of the 28 European Union members regarding the Ukrainian crisis. This signals further complications for Brussels’ policy of pressure on the Kremlin. Any sanctions require unanimous support from all 28 EU members. However, Olga Potemkina, head of the European Integration Department at the Russian Academy of Sciences’ Institute of Europe, stressed that it is too early to say whether Greece will maintain an anti-sanctions line in the EU. “Any country can wipe out the EU’s sanctions policy,” explained Potemkina. “However, even though there has been talk since at least June that many countries are dissatisfied with the anti-Russian sanctions, not a single one has dared vote against them. We will only be able to talk about the start of an anti-sanctions movement if Greece votes against them at least once. It seems to me they won’t let Athens do that,” she said. Kiev may reduce its gas dependence on Russia in the near future, reports online newspaper Gazeta.ru. Ukraine is not paying in full for Russian gas as per its contractual obligations, Deputy CEO of Gazprom Alexander Medvedev said at the European Gas Conference in Vienna. “When you order a steak at a restaurant and they bring it to you, there is an understanding that you need to pay for the entire steak,” the executive explained. “Outside of the winter season, Ukraine does not need imported gas at all to meet its internal needs,” said Alexei Grivach, deputy chief of the Russian National Energy Security Fund . However, Valentin Zemlyansky, a Ukrainian energy expert and former press officer at Naftogaz, says that in the summer Kiev will need to fill up the underground gas storage facilities that it utilizes in the winter. For this reason, Ukraine will be forced to continue buying Russian gas, said Zemlyansky. Otherwise, transit for the following winter will be put in jeopardy. “And that will play into the hands of Russia with its Turkish Stream [the project for a gas pipeline to Turkey, circumventing Ukraine - RBTH],” Zemlyansky said. Judging by arbitration case materials, Russian consumer watchdog Rospotrebnadzor made frequent complaints against McDonald’s restaurants in Russia before August 2014, writes business daily Vedomosti. The watchdog’s attention to McDonald’s grew as the West imposed an expanding list of sanctions against Russia. However, it was argued that all the inspections were routine and in no way connected with the sanctions. Now the inspections are over and the restaurants are open, but McDonald’s outlets have figured in about 100 lawsuits connected with Rospotrebnadzor. However, judging by material from the cases, the inspections were unscheduled and initiated “from above,” Vedomosti reports. Rospotrebnadzor was given several orders to monitor product quality and compliance with sanitary regulations during the summer. The McDonald’s cases were probably opened in connection with this, said Alexei Levchenko, the spokesman for Deputy Prime Minister Olga Golodets. According to him, there were no specific orders related to McDonald’s, but orders are not formally needed if there is a complaint by consumers.